So I pulled out layered flower and here is what I came up with. 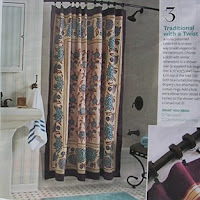 I concentrated on the shower curtain and tried to mimic the shape, colors and pattern. I tried using SU Cranberry Crisp dye ink. I heat set it and colored with my Copics. I still got some ink bleeding though, so I can't really recommend SU dye inks with the Copics, at least not with the paper I use. 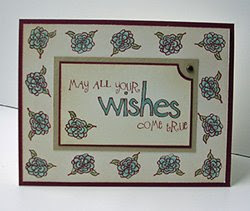 The card also uses "May all your wishes come true", another justjohanna stamp. I inked all the paper edges with Distress Vintage Photo ink and a color duster brush. Its one of my favorite things to do to make a card blend together. I probably use that technique on the majority of cards that I make. I added the brad to incorporate the curtain rod. If I had it to do over, I think I would have spaced the flowers tighter together, and maybe put another thin layer of burgundy behind the tan in the center. Well, there is always next week. Speaking of next week - here is next week's inspiration photo. 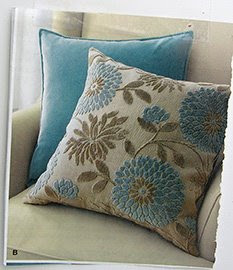 Now those of you that have that mum stamp from SU that I see all over the place have it made with this photo. But alas, I don't have that stamp so I'll need to improvise. Nice colors though huh? Hi Kathy, I joined in your challenge again, it was so tempting! Thanks so much for sharing this initiative and I enjoy seeing what you create every time with these pictures!